Ceiling Mount Curtain Track, Hospital Curtain Track, and Hardware. Scroll down to see our selection of Curtain Track, Privacy Screens and Curtains for sale. Curtain track has many uses and a variety of applications. 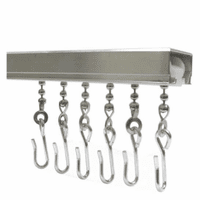 We sell everything needed to hang a curtain track from your ceiling including curtain track carrier rollers, curtain track end stops, 90 and 45 degree curved curtain tracks, splicing clamps and curtain track ceiling clips for facilities with drop ceiling. As well as the hardware you would need to suspend you curtain track from a tall ceiling. Curtain track is a system attached to the ceiling to hang privacy curtains and dividers to separate patients or work space. Many hospitals and clinics use curtain track systems in patient or emergency rooms. Curtain track can also be used in an individual’s home to add privacy for a loved one, to cover a bay window or sliding glass door, or divide a room for additional work space. Curtain track has endless uses and functions for any need. Curtain track has been sucessfully used for lightweight theather curtains and even a golfball stop net in someones basement..